Smash cucumber with a cleaver, cut into thick slices, and transfer to a plate. Crush and mince garlic and sprinkle on top of cucumber. Season with salt and sugar. Drizzle sesame oil on top. Sprinkle diced bell pepper on top. 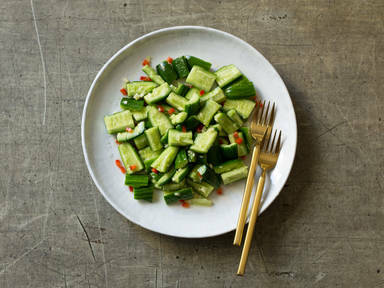 Lightly toss salad and enjoy as a light snack or side dish with Asian fare!